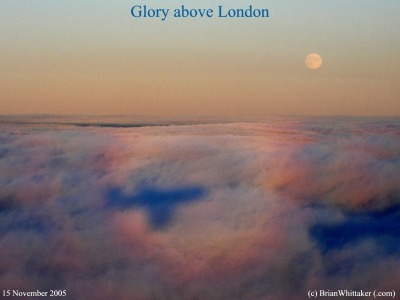 Brian's "Picture of the Week"
A Glory is often seen opposite the sun upon the tops of the clouds below. This Glory, with the aircraft's shadow, was taken just above London, England. Interestingly, the almost full moon completes the perspective. [More on the Glory]. 15 November 2005. [Image 800x600].